Kids' Drawings Speak Volumes About Home : NPR Ed A first-grader's quick doodle can tell researchers plenty about what's happening — or not happening — at home. 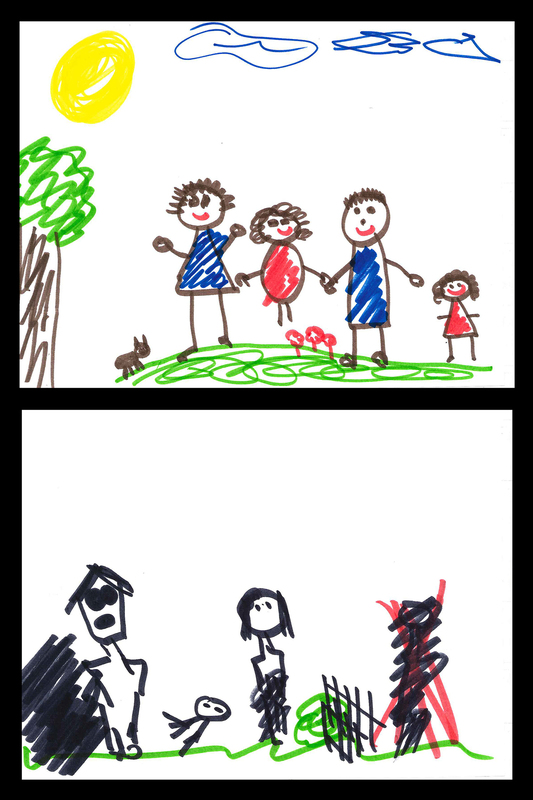 Examples of a family drawing assessment: A drawing from a child scored with minimal indicators of family dysfunction (top), and one from a child scored with elevated levels of family dysfunction (bottom). As a result, kids ended up with a depreciated sense of self, says Roger Mills-Koonce, who led the study with Bharathi Zvara at UNC-Chapel Hill. To be clear, Mills-Koonce did not blame parents or caretakers but called this kind of stress in the home a "function of poverty." Researchers sat the children down with markers and paper and asked them to draw their families. No coaching. No other instructions. The drawing usually took 10 minutes or less. Six years old is the "sweet spot" for such a test, says Mills-Koonce. Any younger, and a child can't control her pencil. Any older, and she begins to internalize the concept of an ideal family, which could then influence her drawings. Many psychologists use drawing tests as a subjective way of trying to understand children's home lives. What's new here is that Mills-Koonce and his team believe they've created a system of evaluating the drawings objectively — in short, allowing any clinician to look at a child's family sketch and draw roughly the same conclusions. "As an assessment tool this has been around for a while," he says of the drawing test, "but this is taking it and turning it into a research tool." To do that, the team studied the prevalence of certain qualities — sad faces, distance from parents, etc. — and showed that they point to chaos at home, something that had only been suspected before. In the past, some therapists have avoided relying on drawing tests because of their ambiguity, says Kirsten Cullen Sharma, a neuropsychologist at New York University who once used the tests but no longer does. "My colleague might not interpret drawings the same way as me, so there's a need to continue to develop evaluations so that we can rely on them," she says. This new research is the first step toward making that reliability a reality.